We are collecting 100 Stories of escape and survival from domestic violence to provide hope and support to those who are currently living in domestic violence relationships / circumstances. By telling their story in a safe way, the story tellers may also be assisted in their healing journey. So far we have 62 Alice Stories Just click on the puff-ball picture and the website will take you to The Stories page. Alice may be in her teens or in her 90's. She may live in the city, a country town, or on a remote rural property. She is from all cultures and financial situations. Alice has experienced domestic violence including physical, emotional and/or sexual abuse. Alice is a survivor. We do not judge Alice. For some, the telling of their story in a safe way can assist with the healing process. 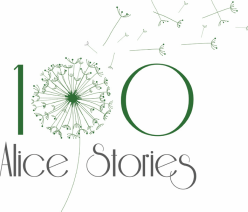 The 100 Alice Stories project was created to offer an avenue for domestic violence survivors to tell their story. Domestic and family violence is a pattern of abusive behaviour in an intimate relationship or family relationship where one person assumes a position of power over another and causes fear. Remember that domestic and family violence involves more than the physical acts of abuse. Perpetrators target self-confidence through derogatory words and emotional abuse and try to ‘grind down’ the people they abuse. .For more information see: www.1800respect.org.au﻿. It is important that you do not place yourself into risk or increase the risk of the persons that you are wanting to help. We encourage you to visit the resource websites around domestic violence such as www.1800respect.org.au, www.whiteribbon.org.au and many of the other available sites. Remember, if you or someone else is in physical danger, ring 000 and ask for assistance.